This week, a Greek marine conservation group is reporting a “very unusual” spike in dolphin deaths in the Aegean Sea. The deaths coincide with military drills in the area. Researchers want to know whether nearby countries are following international rules about sonar and other undersea noise-makers. 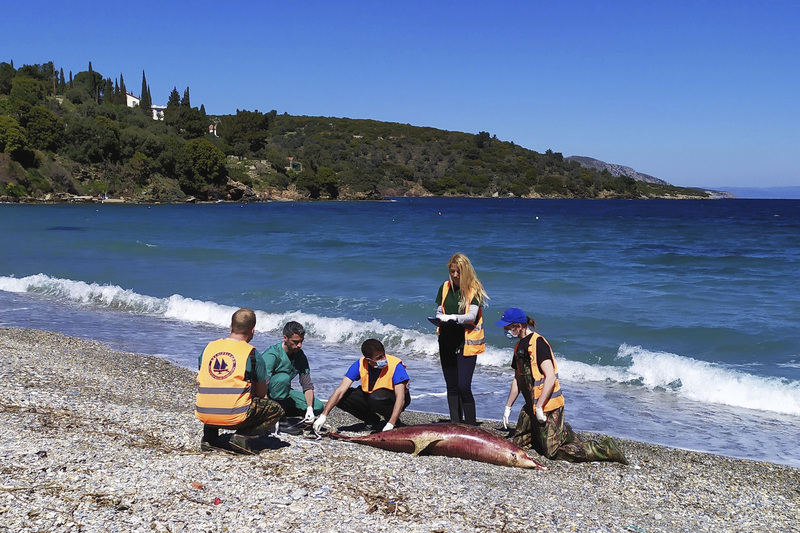 Fifteen dead dolphins have washed up on Greece’s Aegean coastline since late February. The head of research at the Archipelagos Institute of Marine Conservation, Anastassia Miliou, believes that 15 is a disturbingly high number compared to “one or two” in the same period last year. Institute researchers say it’s unclear what caused the deaths. However, they know the spike followed Turkey’s largest-ever navy drills in the region—the February 27-March 8 “Blue Homeland” exercises. The maneuvers used sonar and practiced with live ammunition. The deafening noise of sonar, used by warships to detect enemy submarines, can injure God’s undersea creatures. Such loud sounds can drive dolphins and whales to surface too fast or beach themselves as they try to escape the noise. After previous whale beachings, the North Atlantic Treaty Organization (NATO) adopted a code of conduct for using sonar to better protect marine mammals. Both Greece and Turkey belong to NATO. Miliou says NATO’s rules are respected by the U.S. and Greek navies, but that it’s unclear whether Turkey is following the guidelines. She says the Aegean “can barely handle” overfishing, heavy marine traffic, and pollution in its waters—let alone sonic booms. Thats terrible! I think it was the army drills that killed them did you notice how much it was writen in the articul? unless there is a underwater desis that killed them. I wonder if WorldTeen will rite a UPDATE articul when they find out what happend. if i were a dolphin and I hered a loud nois that wouold probley scar the life out of me!! Aww, that's so sad. I bet it was the drills that killed them. I like dolphins, they seem like such cheerful creatures. I heard about this being a problem a while ago. I can't believe that it's still a problem. You would think something would have changed by now. have any of you sean a real life donfin in the ocean? I have when we were in hawaii and Floedia. I have seen dolphins at Sea World. This is so terrible, if the drills are the problem they should definitely stop. thats so sad............and does anyone study latin?!?!?!?!?! i did iin 5th grade. me it is hard but interesting. Oh wow! This is so sad!!! I study a bit of Latin. We do about four new words a week! Yeah, it is sometimes hard, but it is really interesting and helpful. What book do you use? Last year I used Latin for Children A, this year I am usingFfirst Form, and the next six years I will use Henle. I have seen dolphins in Florida or Tybee Island when we went on a dolphin boat. One dolphin flipped for us! :-) So yes, I have seen a dolphin in the ocean. My brother has taken 4 (I think) years of Latin, so he's pretty good! I am learning ancient Greek. That's so sad!! I hope that the dolphins stop getting killed. @bethsarah I study Latin. I use the Henle Latin. That's so sad how could this happen to so many dolphins their like some of the best creatures of the world!!!! and yes bg I was but I hated it so I avoided it so now I don't have to do latin anymore YAY!!!!!! What I think Sophie C meant was a dolphin is her spirit animal. I think mine was a lion or a snake. Do you do Classical Conversations? If so, what Challenge level are you in? Next year I will be in Challenge A.
what s a spiret animal?!!!!! This is what it said on the web. In certain spiritual traditions or cultures, spirit animal refers to a spirit which helps guide or protect a person on a journey and whose characteristics that person shares or embodies. It is also metaphor, often humorous, for someone or something a person relates to or admires. Ella B...Ikr! Why is it red? Maybe blood??? (o0o) no offence i do not want to star a debate about this but... THAT SOUNDS LIKE WITCHCRAFE!! dont take it personal. just a warnong! Oh the first part is not what I believe in at all, that is just what the internet said it means. This is the part I use, It is also metaphor, often humorous, for someone or something a person relates to or admires. This is terrible, the (NATO) sounds very good. I think it was the sonic sounds from the boats that killed them. I hope Turkey will agree with (Nato). I love Dolphins!! This reminds me of minecraft but like a thousand times sadder. Nadia, Kind of like a favorite animal...it would be like the animal that relates most to you. Example, Dolphins are playful and smart, if you were playful and smart a dolphin might be your spirit animal. Or like a lion is fierce and bold, an elephant is attentive, and social, deer are intelligent and witty, etc. hmmm..I'm not convinsed. I will pray about this. How does it remind you of Minecraft? maybe Because in mincraft you kill you oponits things? i rilly have no idea but an aquatans of mine sead that she was doing that in the game. was that to me? if so I am!! !